November is Child Safety & Prevention month. Each year, close to 16 million schoolkids walk home or are dropped off to empty houses and apartments. According to the U.S. census, one third of all school age children in the United States are, for some part of the week, latch key kids; that is, they go home to an empty house or apartment. Between 5 to 7 million of those children are between the ages of 5 and 13 years olds, Marian Wright Edelman, the director of the Children’s Defense Fund, said, even though laws usually only allow children from age 10 and up to be home alone. The Census Bureau found that 15% were home alone before school, 76% after school and 9% at night. Presumably, the 9% have parents who work night shifts. Considering that many schools let out before parents get home, it should come as no surprise that many budget-conscious parents allow their children to let themselves into the home and stay there unsupervised until an adult can get home. It’s cheaper than after-care or hiring babysitter for those few hours in between bus drop off and when they get off of work. Fortunately, there are tools out there that parents can rely on to make sure their child reaches home safe. Latchkey kids lose their keys or forget them at home during the rush and hustle to get out the house in the morning. The Master Lock mounted key lock ($37.98), which we got a complimentary review version to check out, solves this problem. The lock easily mounts on a back porch or can be propped up unmounted in a discreet location near the house. The key is secured inside a weatherproof container that is accessed by a code that the home owner comes up with using up to 12 letters and numbers. It’s a superb solution for families who want to ensure their latchkey kid isn’t locked out or to make sure a kid dropped off after an after-school event can get inside the home in case parents are away! It’s a worthwhile investment for peace of mind. It can also be a great tool for family that drop in unexpected during the day while a homeowner is away or for those that are away on an extended vacation or business trip and want a neighbor to come in to check in and feed a cat or to water the plants. 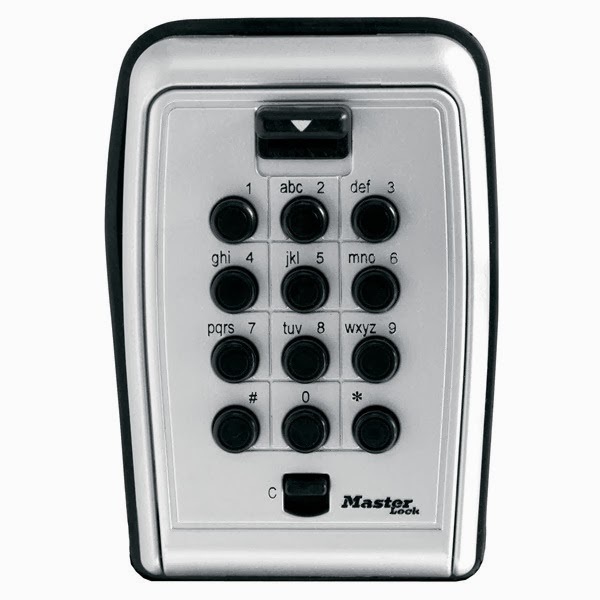 Our 8 and 11-year old reviewers were able to easily enter the code and access the key with no problem. It’s a great tool! As we ease into daylight’s savings’ time, it is getting darker earlier and children coming home from afterschool activities are finding themselves having to arrive home in the twilight hours. Uh Oh bands are wrist bands with a parents’ phone number and the words “Uh Oh I’m lost!” on them. They also come in glow in the dark material for late hours and are excellent for younger kids who have a short romp to walk from the bus to home. They are also wonderful for field trips or family outings in busy shopping malls, for example, which will be GREAT this upcoming holiday season. They run $10 each. Finally, it’s always a wonderful idea to know if there are sexual predators or other individuals who were convicted for crimes against children or juveniles nearby. We got a complimentary trial access to InstantCheckMate.com and were able to determine with a simple input of our zipcode where all the sexual predators resided in our town. With that knowledge, a parent will know to map a child’s trek home to avoid the areas where predators live. It’s not all ex-cons will commit a crime again, necessarily, however, past news stories of ex-child offenders kidnapping or harming children create worry among parents. It’s better to be safe than sorry. The service also offers a public records-location service and helps people find lost friends or family for a monthly fee. A standard 6 month membership is $59.16 for a half a year, with varying other options. A 5-day trial membership is available for $1. These tools are great starters for helping keep families on track and safe!